Order Ecover Fabric Softener - Gardenia from the Online Health Food Store UK. Buy Ecover Concentrated Fabric Conditioner Gardenia - 750ml and other quality Cleaning & Laundry safely online in the UK. New Fragrance! 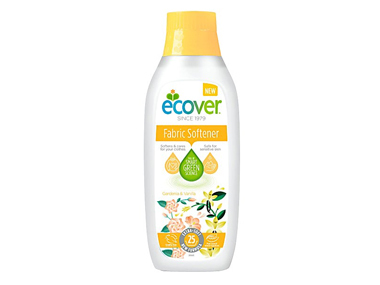 Ecover Fabric Conditioner is a plant-based formula and gentle on your skin, doesn’t overpower your nose. From the humble sock to king size bedding, keep your laundry soft and fresh with Ecover Fabric Conditioner. This plant-based formula is gentle on your skin and doesn’t overpower your nose. Helps reduce static for easy ironing and cuddly clothes. Our UK Health Shop sells real Ecover and other Cleaning & Laundry from top-quality brands safely online to customers throughout the United Kingdom in England, Wales, Scotland and Northern-Ireland. View more products on the Online Health Food Store from Ecover. Where to buy Ecover Fabric Softener - Gardenia safely online? Shop at the Online Health Food Store if you are wondering where you can buy Ecover Concentrated Fabric Conditioner Gardenia - 750ml safely online in the United Kingdom. Our Health Shop is located in the UK and our award-winning independent has been serving customers in England, Wales, Scotland and Northern-Ireland since 1976. You can buy our Cleaning & Laundry online and we post out orders to any UK address. Fabric Softener - Gardenia - Ecover Concentrated Fabric Conditioner Gardenia - 750ml in Cleaning & Laundry and Household.